We hope you get the opportunity to stay in this beautiful one of a kind 4 bedroom 3 bath furnished vacation rental. 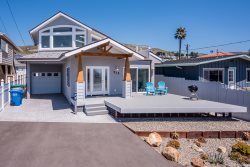 Perfect location to stay and become part of the Cayucos community for a month or longer! Two master suites, two living areas with views and decks. All bedrooms have a king size bed. Steps away from the beach and close to downtown. Amazing panoramic views of the ocean, mountains, and hills. 360 degree wrap around deck.Amenities: WiFi, BBQ, W/D, dishwasher. Vacation ready!